Today was the regularly scheduled meeting of the Watnong chapter of the North American Rock Garden Society. Two members each gave brief presentations, a brief lagniappe before the main lecture. Bob's was teasingly entitled "how Joe saved the coontie patch." Who is Joe? What's a coontie? Enquiring minds want to know. Coontie, it turns out, is a kind of cycad. Here's Bob, with a cycad. were here with the dinosaurs. Thanks to Joe, they're still here. Here's the back story. Late last century, back in 1992, an Asian cycad scale was accidentally introduced into Miami, Florida. In addition to killing tens of thousands of native coonties, the cycad scale has spread throughout much of the southeastern United States and as far afield as Hawaii, Guam, and Taiwan. Not only do the scale insects have an extremely rapid reproduction rate, a stiff breeze can blow them half a mile. Add its ability to go underground and infest the plants roots in cooler weather, and you begin to see how difficult it becomes to control. Previously the most effective method required the use of insecticides not licensed for homeowners. 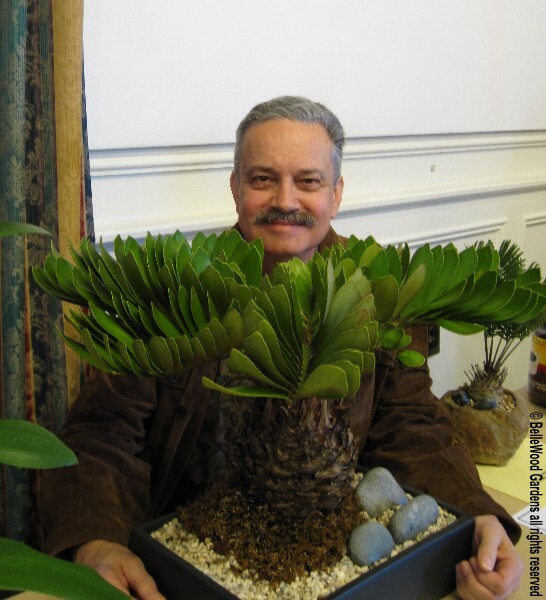 In 2002, Tom Broome (owner of Cycad Jungle nursery and a past president of the Cycad Society) was visiting a nursery with a couple of acres of field-grown coonties. Rather than infested plants so covered with scale that they appear white with snow these healthy plants were growing so lushly that their leaves screened the ground. The apparent answer: the grower had topped the seed, sown on sandy soil, with several inches of used coffee grounds sourced from a local coffee extract plant that was giving the used grounds away by the truckload. The intention was as a means to keep the seed moist and also add organic matter to the sandy soil. Best results came with regular, rather than decaffeinated coffee grounds, particularly dark espresso roasts. A couple of points to keep in mind - used coffee grounds tend to get moldy when damp for a long period of time, losing their effectiveness in treating scale. Also, the solution also loses its effectiveness over time so it is best to brew up only what will be used within a short period, perhaps a month or so. Mystery solved, and now you know. 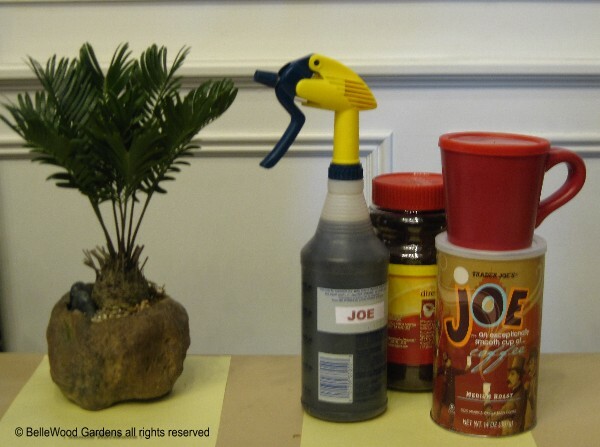 Joe is that cup of java, and a coonite is a cycad. Alkaloids in coffee can do more than energize your day. They're an option for dealing with certain insect pests in the garden.